The Too Faced Peach Palette has finally arrived in the UK- hurrah! I'd been stalking Debenhams website for a while so when I saw it was in stock I was adding that to my basket pronto. 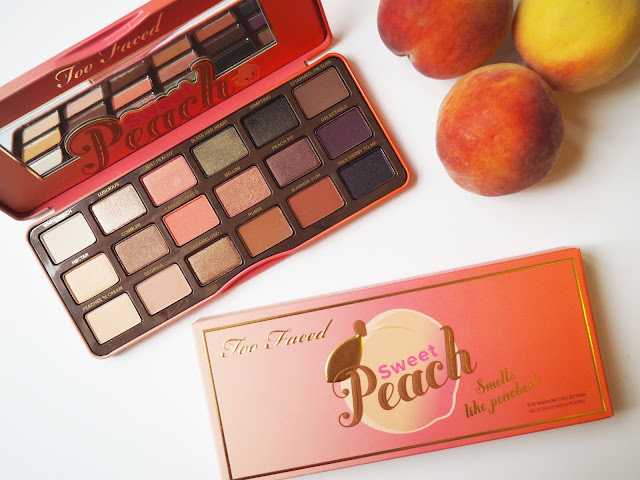 If some how you have missed all the hype surrounding this palette then let me fill you in.... earlier in 2016 Too Faced released the Peach Palette as a limited edition product and it was so popular that they have decided to give it a second run for those of us that didn't snag it the first time, I should even expect there will be several people buying a new one as the first one they had has been so well loved. Now, funny/regret story, when this came out the first time I actually went into Debenhams Oxford Street, picked it up, got all the way to the till before changing my mind about it and putting it back. You know you have those moments you look back on and think 'what the f*ck was I thinking?!' well that is one for me, so knowing it was going to be released again meant there were no two ways about me buying it this time around. 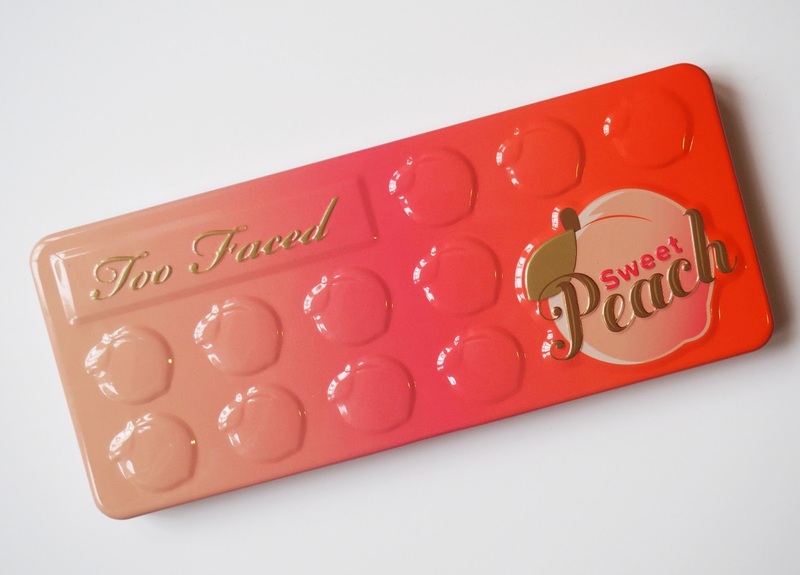 Too Faced are renowned for their super cute packaging and this is up to the usual standard. First of all I like that it's in tin type packaging, this makes it extra sturdy so I know I can take it travelling with me. I travel a fair bit with work and my Chocolate Bar Palette gets bashed around in my bag and is completely fine, so I trust Too Faced packaging if you get me? I know its well made and will protect the product. It's along a similar vein to the Chocolate Bar series in that its the same size, has a mirror in the lid etc. The ombre orange just looks amazing, its one of those things you look at and just want to use because its so damn pretty. Just as a random aside whilst we're talking packaging... the box it comes in feels really nice, kind of like the feeling the Nars packaging has. I know that isn't a major selling point and I don't even keep the boxes personally but I just thought it was worth mentioning. 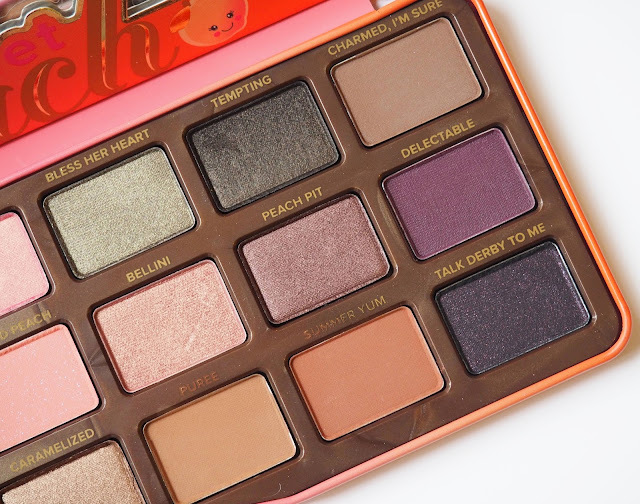 Too Faced attention to detail is always spot on. With this being the peach palette of course there is an amazing peach scent to the shadows. There isn't really any purpose of the shadows being scented, its not like you can smell them when they are on, but its just a nice touch. Having said that you can look a little strange inhaling a make up palette on the train but who cares? If you don't buy this palette at least find one to give a good sniff, your nose will be very satisfied I promise. You get 18 shadows for your £39 which in my opinion isn't bad at all. 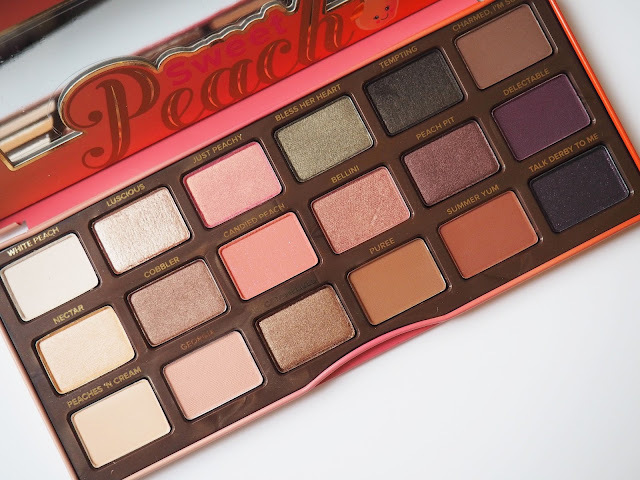 I do appreciate its a lot of money but there are a tonne of looks you can create with this bad boy and the shadows from Too Faced are always amazing quality so in this case you do get what you pay for. The shades range from creams, greens, pinks to purples and just from swatching these I fell in love. They are so pigmented, smooth and not powdery at all. A few stand out shades for me are 'Bless Her Heart' which is a shimmery olive green that reminds me a little of Mac's Sumptuous Olive, Bellini which is a peachy pink shimmer, Summer Yum which is a matte orange and Just Peachy a two toned pink/ gold. The only shade for me that is a bit of a let down is Delectable, I just find there isn't much colour pay off and you can see that in the swatch, the formula doesn't seem as soft but maybe thats just mine? 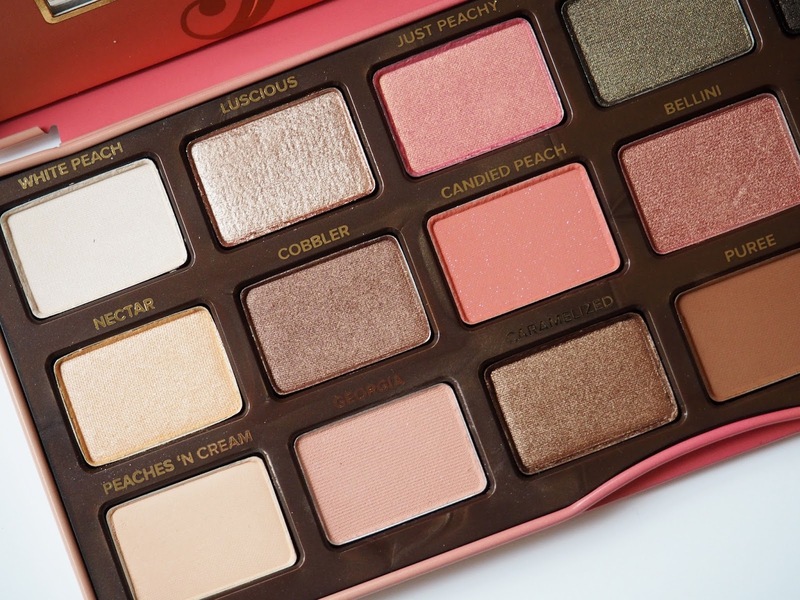 Let me know if you have this palette if yours it like that too! Overall though am I glad I bought this? Errrr..... YES! Of course I am. Too Faced products are some of my absolute favourites, I think they have such a unique, well thought out brand. The shades in this in the summer are going to look amazing but of course I expect I will be using is loads in these colder months anyway!